The five countries, Brazil, Russia, India, China and South Africa dubbed BRICS are among the fastest developing world economies today. They have recently come together to foster mutual development necessary to meet challenges in various fields including science and technology. These countries have forged ahead in terms of their productivity in science and technology. The BRICS collaboration provides a broad platform for mutual cooperation in social, economic, science and technological fields. Broad consensus among BRICS countries has been reached and now focus is on giving concrete shape to collaboration in specific areas, in particular, in the field of science. The BRICS official document (SANYA declaration, 2011) states: We intend to explore cooperation in the sphere of science, technology and innovation (point 28). There is emphasis on joint meetings of senior officials for discussing ways of promoting scientific, technological and innovation cooperation for BRICS (point III.4) and on establishing networks of research centers of BRICS countries (point I.9). During the past decade, BRICS countries have made notable progress in studies of gravitation, astrophysics and cosmology. Considerable work has been done in theoretical studies of fundamental physical laws governing the observed universe. Further progress requires synergy between theoretical studies and observations. Observational facilities require large investments. Advanced LIGO and SKA taken up by India and South Africa, are examples of large observational projects. The BRICS countries have the potential and manpower to support large projects in the field of astrophysics. It is of utmost importance today that BRICS scientists come together for mutual support and training of young experts in order to improve the quantity and quality of research. 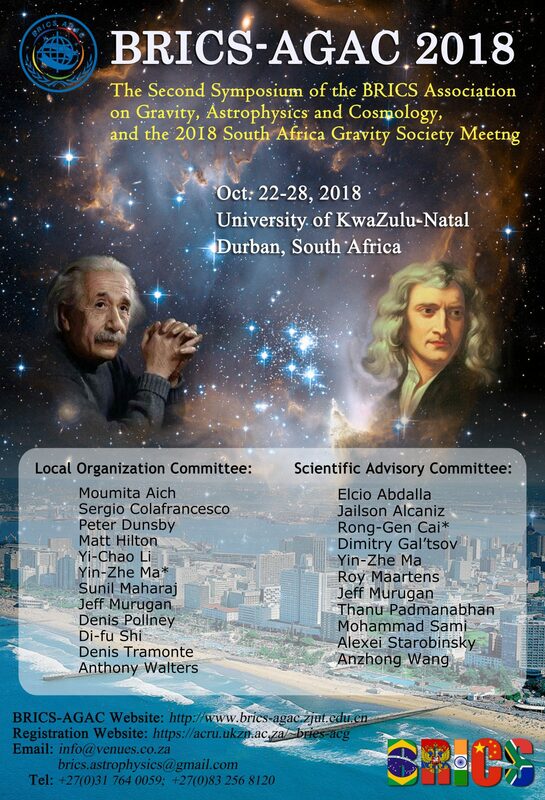 With these general goals in mind, the BRICS Association of Gravity, Astrophysics and Cosmology (BRICS-AGAC) has been formed.